1962, 1978, 1981, 2000, 2019, all dates that have embedded themselves firmly in the annals of the history of Ipswich Town Football Club, of course Four of them remind us all of glorious glorious times which will forever be remembered by us all, sadly the latest date is going to go down in our history for all the wrong reasons, after a stay of over Sixty years in English Football's top Two divisions we now find ourselves consigned to plying our trade in the Third tier for the first time in mine and many other Town fans life time. As I stood on Saturday watching the game and with it our time in the Championship ebbing away I could not stop the flashbacks in my head of happier times, remembering how I stood as a kid just a few feet away from where I stood Saturday, watching us take apart Man Utd 6-0, Barcelona 3-0, WBA 7-0 etc etc, the list is endless, cheering on the greats, Beattie, Wark, Mariner, the Two great Dutchman, again the list is endless, every now and again coming back to the here and now and what was unfolding in front of my very eyes and the reality of what it means, we had all been expecting it for some weeks and yet deep down realisation was hitting me with a vengeance. The blame game as to who is responsible can go on forever and a day and this is not the time or place that I want to go over it again, right now I am tired of it but all I will say is it goes back much further than many realise. The final whistle brought a lump to my throat but this was not to be the end of my emotions by any means, with relegation now confirmed the players stood rooted to the spot, some fell to the ground, Chambers in tears, Nsiala in tears, Judge holding his head, but there was no booing or unrest, instead what we delivered was something I will never forget, the North Stand rose to a a man and saluted our beaten players in a way I never dream't was possible, it was a incredible few minutes, Paul Lambert stood and just gazed in amazement with his players doing likewise as if to say how can this be !! The fightback starts now, it has to, we don't belong in League One and hopefully the stay will be brief but it won't be easy, far from it but with a togetherness like what I saw on Saturday we have a chance, keeping it together is the key, some will try to derail it with their negativity no matter what happens going forward but hopefully they remain in the minority, we are all despondant after all but it's how we react to the situation that will determine how quickly we bounce back. I honestly thought I was well prepared for Saturday and accepting of our situation, I wasn't. Having left the stadium and starting the long walk home the battle to hold back the tears was tough, clearly my attempts were fruitless as it took a comforting hug from HallamBlue who was clearly aware I was feeling it, ITFC are a massive part of my life and it means something so it had to come out. Already that is in the past and it is the future I am focusing on now, I think it is vital that for me at least I have to believe better times are ahead, from what I have seen in recent weeks we need fear nobody but that is for another day, this season needs to be concluded first and the sooner the better but next up is Preston North End, will I be there, you betcha. ITID. Preston North End was originally founded as a cricket club in 1863, by Mr Walter Pomfret of Deepdale Road, who was the first person to rent the field on which North End has always played. The original rent was £8 per year. As Preston already had a strong town's club, they adopted the "North End" suffix because they moved to the North End of the town when Moor Park opened, playing their matches at Moor Park. Prior to that they played at Bow Lane. The club adopted rugby union code in 1877, but one year later they played their first game under the rules of association football, and in May 1880 unanimously passed a resolution to adopt the association code. Preston were relegated to the Second Division in 1961 and have not played in the top division since. The club did reach the FA Cup final in 1964, but lost to West Ham United. Preston were relegated to the Third Division in the 1969–70 season. The club won the Third Division title at the first attempt and so returned to the Second Division. Bobby Charlton, an England World Cup winner from 1966, was appointed Preston manager in 1973, but was unable to prevent the club from sliding into the Third Division in his first season and left after two years in charge. A brief respite in 1978 saw Preston win promotion back to the Second Division, but go down after three seasons. In 1985 the club fell into the Fourth Division for the first time in its history. In 1986, Preston finished second from bottom in the Fourth Division and only avoided dropping into the Football Conference because the other Football League members voted in favour of the division's bottom four teams retaining their senior status. A year later Preston won promotion to the Third Division and they were still at this level until 1990 when they were relegated from the first season of the new Division Two. Preston were Division Three title in 1997, and in February 1998, 34-year-old defender David Moyes took over management of the club. Preston quickly developed into Division Two promotion contenders under Moyes, reaching the 1998–99 play-offs but losing out to Gillingham in the semi-finals, before finally being promoted as champions a year later. Preston began the new millennium by winning promotion from Division 2 in the 1999–2000 season as champions. The club almost made it two promotions in a row in 2001 but lost 3–0 to Bolton Wanderers in the Division One play-off final. Moyes left for Everton in March 2002. Preston were little more than a mid-table side until the 2004/5 season when Billy Davies took over and guided Preston to the Championship playoff final in his first season as manager, but they lost to West Ham United. The club reached the play-offs again the following year, this time losing out at the semi-final stage. Preston spent much of the 2006–07 season in the automatic promotion or play-off places. However, from March 2007 the club slid rapidly down the league. On 11 July 2007, Nugent, the first Preston player to win an England cap for 50 years, left the club to join Portsmouth for a reported transfer fee of £6,000,000 and they did not recover from their poor run of form. After a bad start to the 2007–08 season which saw the club pick up just three wins, Paul Simpson was sacked as manager on 13 November 2007 and Alan Irvine was appointed as Preston's new manager on a three-and-a-half year deal. He achieved his first objective as manager by finishing in 15th place, thus securing Preston's survival in the Championship. The following season, he led Preston to 6th place in the Championship after a good run of form towards the end of the season, qualifying for the play-offs. On 29 December 2008, Irvine was sacked after a poor run of results, with the club appointing Darren Ferguson as his successor and he narrowly secured their survival in the Championship. 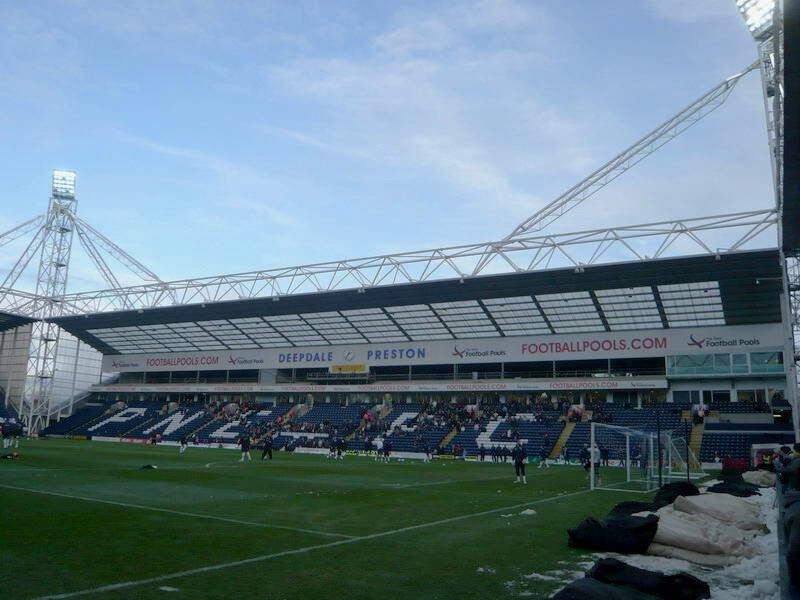 In the 2009–10 season, Preston finished in 17th place and in the following season they were bottom of the Championship when Ferguson was sacked at Christmas. Former Hull City manager Phil Brown was appointed as Ferguson's replacement, but could only achieve his first win in his 13th game in charge. This sparked an improved run of form, but could not prevent relegation to League One. Brown was sacked on 14 December 2011 after less than a year in charge. After four weeks of interviews, Preston approached Stevenage manager Graham Westley and he was appointed manager on Friday 13 January 2012. Following a poor string of results, including a club record run of 12 home games without a win, Westley was sacked as Preston manager on 13 February 2013. On 18 February 2013, it was confirmed that Simon Grayson had taken charge of Prestonand by the end of the 2012–13 season Preston were safe in 14th place, 11 points clear of relegation. Preston won promotion to the Championship after beating Swindon Town 4–0 in the League One play-off Final on 24 May 2015, having failed in their previous nine appearances in the play-offs. 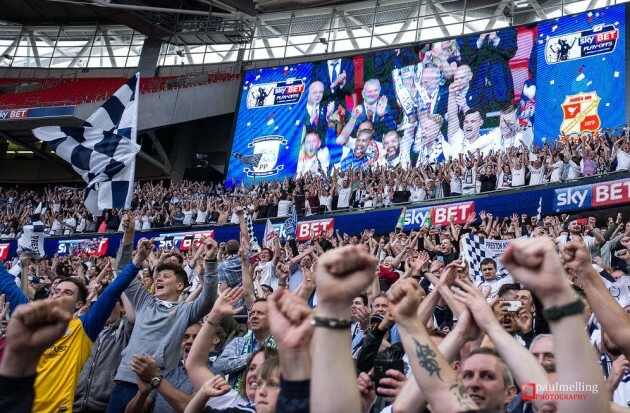 Since promotion to the second tier, Preston have achieved two successive top-half finishes despite having the third-lowest budget in the Championship, relying on a shrewd transfer policy and the development of young, relatively inexpensive players. Last season Preston just missed out on featuring in the playoff’s, finishing in 7th place with 73 points. But as the week passes and the season eventually comes to an end, (sooner the better) ..... it’ll all turn to excitement. It really will because there is nothing else for it except be excited about the new sets of fixtures. Some will wallow in despair but that’s a Shyte summer, innit? And you’d be asked to get yer twisted a$$ face the fk outta ma house! I hope you two, halkamski and Mike had a wee bevvy on Saturday together. Few laughs. And now for some despair from the plunging guru of the prediction league........ 4-0 Preston North End. MoleMan will be wanting salt rubbed in the wounds. Guaranteed....... and a recovery from their Hawthorns lesson. Player: What’s your decision after viewing the VAR screen ref? Caption "What the hell was that call ref" "Ha Ha I thought you would like that!" Caption .... How to get a head in management part 2. Alex Neil’s mole starts giving him tactical advice. Go to work with an axe, Nics? Refuse to promote a woman! Juuuuusst kidddding, calm down!! It will be interesting to see how the team play now relegation is official. I suspect not a lot will change in terms of how the team play because I believe the team have in the main played without fear and that has been Lamberts approach since he took over. They must have been hurting inside but they should now put that behind them, what's done is done and next season starts at deepdale on Friday. No idea how this one will go so I will sit on the fence 1-1. Caption; look at the size of that moles as*hole ! I feel sorry for it having to carry that around all day. Caption. 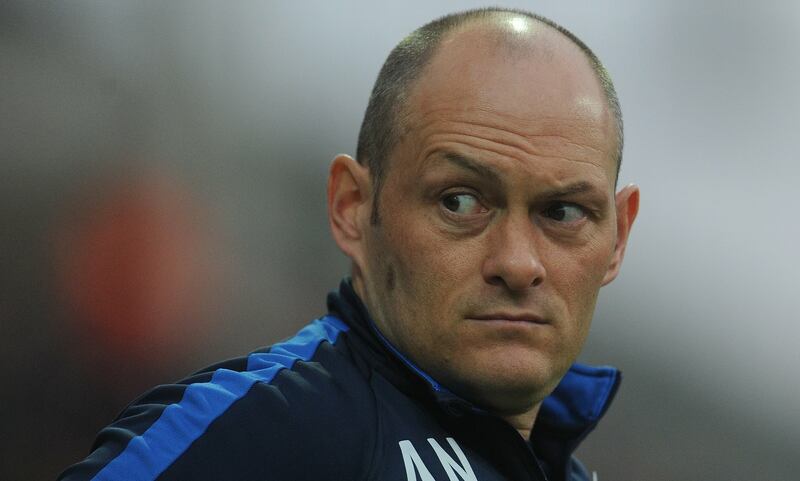 Marcus Evans asks Alex Neil if his Mole would like to be Towns next Manager. Caption. Alex Neil was sacked by the scum when their Team sheets and tactics were leaked. When asked by a reporter Neil replied, " i think we have a Mole" Reporter " you sure f**king do Alex". Caption. When are you going to get that disgusting blob removed? Mole, as soon as i can. Last edited by derick_ipsw on Thu Apr 18, 2019 8:58 am, edited 1 time in total. Had to view the opposition recent scores to ascertain what to expect for this. Voted for a drawn game, another situation with both teams got zero to play for. In retrospect always feel if we had played them in the '05 play-off Final we may just have won but what's done is done. Hope the team puts on a performance and adds extra encouragement for the remaining games of our second league status. Went to Preston on the train in the day. (3-O fa Cup) We won and and had a bottle lobbing fight with about 10 Preston yoof. Caption; Action Mans EagleEyes becomes new Preston boss and immediatley employs Barbie as his PA.
Yoof! You been watching Rio Ferdinand, Pete? That probably would be Action Man now eh? Receding and all that. Yeh it probably would Just missing the scar. Think he had blond hair and a s are. Did they have a ginger Version with a kilt in Scotland ? Did they have a ginger Version with a kilt in Scotland ? Now that would've been awesome. A "talking commander" version going commando under his kilt........, "Advance in single file ya bawbags." .....and with the sound of bagpipes blasting out to put the fear of God into the enemy. Now heading off !!! IPSWICH TIL I DIE!!!! ......and with the sound of bagpipes blasting out to put the fear of God into the enemy. Caption,; that beauty spot is clearly not going to get a job anywhere else! Don't forget the Tennents Super......stake bake and Tennents Super what a combination. And having to go install gas pipes after that lunch combo. Not good. Starting eleven line up is an all non-loanee one. El Mizouni starts. Jackson up front. Will Keane on the bench. Edwards not in the squad, so not sure who’s wide right? El Mizouni or Bishop?